Qian Liang and Stephan Wissel have contributed a new release of the project Workflow for XPages. See below for their description. "The project Workflow for XPages targets to provide an easy way to develop workflow applications with XPages. There is a built-in lightweight workflow engine in this project allowing XPages developers to create workflow applications quickly. Also with this project it's easy to connect to other workflow engines. 1. Implemented a new XPages custom control called CommonWorkflow control which can be used to connect to the Activiti workflow engine. A sample application was developed to show the capabilities of the Activiti workflow engine integration. The Activiti workflow engine is an open source workflow engine under the Apache 2.0 licence. 2. Provided a sample implementation to wrap the Activiti workflow engine server into an OSGi bundle which can run on Domino servers. 3. Supplied a framework allowing third parties to create their own workflow engine connectors. Additionally a common API was defined to access various backend workflow engines in XPages." 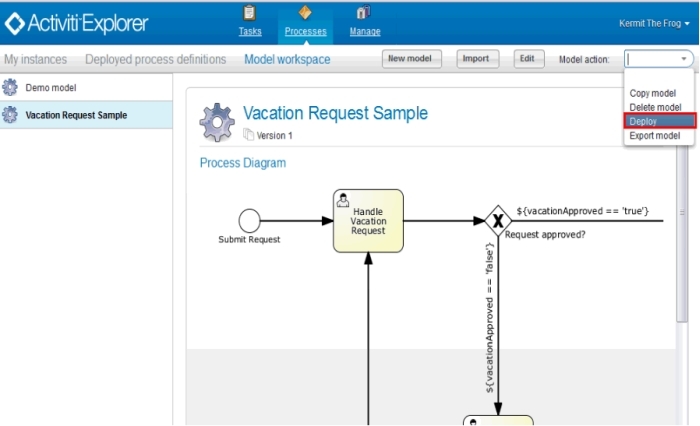 The screenshot shows the Activiti workflow designer tool, called Activiti Explorer. There are more screenshots in the project.